In Syria, culture has become the critical line of defence against tyranny. Villagers have joined the cultural frontline alongside urban intellectuals, artists, writers and filmmakers and to create art and literature that challenge official narratives. With contributions by over fifty artists and writers, both established and emerging, Syria Speaks explores the explosion of creativity and free expression by the Syrian people. They have become their own publishers on the Internet and formed anonymous artists collectives which are actively working in their country's war zones. 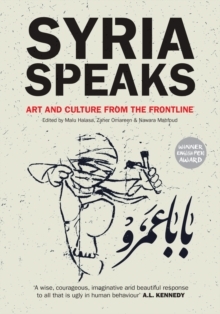 The art and writing featured in this book, including literature, poems and songs as well as cartoons, political posters and photographs, document and interpret the momentous changes that have shifted the frame of reality so drastically in Syria.